With 2017’s Justice League Dark, we get something unusual from DC Entertainment: an “R”-rated animated adventure. Dark isn’t the first of these direct-to-video tales to go “R”, but that remains a daring choice for the genre. A series of calamities evolve around the world, and these mean that people see demons wherever they look – even when they simply view their children. In the face of these threats, the Justice League recruits supernatural beings to participate in the fight. 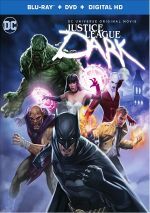 This leads to a “dark” version of the Justice League, one that includes figures such as occultist John Constantine (voiced by Matt Ryan), magician Zatanna (Camilla Luddington) and ghostly Deadman (Nicholas Turturro). Along with Batman (Jason O’Mara), this crew goes after the threat. As I suspect I’ve noted in the past – and will probably mention again when I get to 2016’s Doctor Strange - I read pretty much every comic on the shelves when I was a teen. For a few years, I’d buy every DC and Marvel title I could find. Of course, I liked some more than others, and supernatural tales resided low on my list. I read them due to my general “completist” tendencies, but I can’t claim they ever did a ton for me. Those preferences made me less than optimistic that I’d like Dark. Sure, Batman came along for the ride, but the presence of so many magical characters and themes led to skepticism that I’d dig the movie. The end result fares better than I feared but never threatens to turn into anything great. While Dark offers reasonable entertainment, it fails to elevate to a higher level. On the positive side, Dark involves more humor and action than I figured it might. I thought the tale would a) be dour and sullen while it also b) focused so much on mystical mumbo-jumbo that it lacked oomph. While not a laugh-fest, Dark includes a good selection of dry humor. Those elements lighten the load and decrease the film’s potential for excessive self-seriousness. Dark also offers quite a bit of action. We do find some of those “ethereal plane” moments that I don’t like, but much of the film concentrates on good old faction battles that add a flavor of zest to the proceedings. Despite those positives, I still view Dark as less than enthralling, mainly because it suffers from a lackluster core story. Dark fails to present a clear villain for much of its running time, and the absence of a dynamic antagonist loosens the narrative’s general clarity. This means Dark ambles a bit too much and can feel like it lacks purpose. Even when we get an actual villain, the baddie seems mediocre and not one to enliven the tale. Some stumbling blocks come from the array of new-to-us characters on display. A few “origin story” moments arise – mainly for Deadman – but a lot of the roles appear without much background, and that becomes a minor issue. On one hand, I think a Dark with one “origin story” after another would get tedious, but I also feel it could’ve used better nods to the characters’ backgrounds and powers. We don’t connect with the roles as well as we might if we understood them better. Even with these drawbacks, Dark becomes a reasonable adventure. Nothing about it really excels but the tale offers enough action and intrigue to turn into a watchable little piece. Justice League Dark appears in an aspect ratio of approximately 1.78:1 on this Blu-ray Disc. This became a solid presentation. Overall accuracy varied from very good to excellent, with an emphasis on the latter, so don’t expect issues with softness. No shimmering or jaggies materialized, and I saw no edge haloes or noise reduction. Of course, I found no print flaws here. In terms of colors, Dark went with a stylized look. It tended toward low-key tones and favored a mix of red and teal appearance much of the time. The colors seemed fine, as they represented their intended schemes. Blacks were deep and dark, while shadows looked smooth and clear. This became a top-notch presentation. When I examined the DTS-HD MA 5.1 soundtrack of Dark, it created a mostly good sense of action. The movie packed a lot of battles and involving material, but these concentrated on the forward channels more than expected. In those areas, the track offered nice movement and breadth, but the back speakers didn’t participate as much as anticipated. Though the surrounds added reasonable pep, they could’ve been more active. Across the board, the material sounded fine. Speech remained distinctive and concise, without edginess, and music seemed vivid and full. Effects appeared accurate and tight, with clear highs and some powerful lows. This was a good but not great mix. Among the set’s extras, we find a few featurettes. The Story of Swamp Thing runs 18 minutes, two seconds and includes comments from DC Entertainment Creative Director Mike Carlin, artist Kelley Jones, character co-creator Len Wein, director Jay Oliva and producer James Tucker. “Story” looks at roots and development, artistic choices and character changes/growth/attributes, and his use in Dark. “Story” offers a pretty good overview of Swamp Thing. Did You Know? splits into four shorter pieces. With a total running time of three minutes, 26 seconds, we find “Constantine Origin” (0:44), “Color of Magic” (1:01), “Black Orchid” (1:03) and “Deadman Casting” (0:38). Across these, we hear from Carlin, Oliva, and Tucker. These give us quick informational tidbits that relate to Dark. They’re too brief to offer much substance. Justice League Dark At New York Comic-Con 2016 goes for 26 minutes, 41 seconds and features a panel with Oliva, Tucker, character designer Phil Bourassa, and actors Matt Ryan and Jason O’Mara. They look at Dark via thoughts about story/characters, cast and performances, art and visual design. Comic-Con panels like this exist to promote product, so they rarely come with much substance. That remains true for this one, so don’t expect much from it. The panel offers a few decent notes, but usually we get fluff accompanied by giddy hoots from the audience. Two episodes of Batman: The Brave and the Bold appear. We get “Dawn of the Dead Man!” (22:43) and “Trials of the Demon!” (22:58). In “Dawn”, Batman fakes his own death and needs Deadman to get back to his body, while “Trials” sends Batman back in time to work with Sherlock Holmes. I like the snarky attitude of Brave and the Bold, and these episodes offer pretty good entertainment. 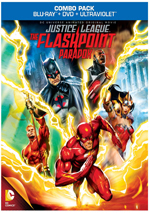 The package includes Sneak Peeks for Justice League: Doom (10:17), Justice League: Gods and Monsters (11:07) and Teen Titans: The Judas Contract (11:41). Across these, we hear from a mix of personnel. Doom provides remarks from Bourassa, co-producer Alan Burnett, executive producer Bruce Timm, voice director Andrea Romano, director Lauren Montgomery, storyboard artist Mel Zwyer, and actors Tim Daly, Susan Eisenberg, Carlos Alazraqui, Carl Lumbly, Nathan Fillion, and Michael Rosenbaum, while Gods provides comments from Timm, Romano, Carlin and director Sam Liu. Finally, Judas features Carlin, Tucker, voice director Wes Gleason, screenwriter Ernie Altbacker, and actors Brandon Soo Hoo, Kari Wahlgren, Miguel Ferrer, Gregg Henry, and Christina Ricci. All three exist as little more than promotion, and they’re fairly effective in that regard. Nonetheless, they remain long ads, so don’t expect more from them. The disc opens with a promo for Wonder Woman. Trailers adds a promo for Batman: Return of the Caped Crusaders. A second disc provides a DVD copy of Dark. It includes the three “Sneak Peeks” and the trailers but none of the other extras. With an unusual cast of characters, Justice League: Dark becomes moderately compelling. Though not a great movie, it gives us a tale with enough dynamic material to keep the viewer involved. The Blu-ray offers very good picture and audio as well as a smattering of bonus materials. Dark seems inconsistent but largely enjoyable. 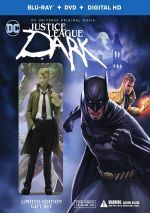 Note that this version of Dark is a “limited edition” that includes a Constantine action figure. The same Blu-ray/DVD combo is also available on its own without the toy for $5 less.